Restaurant De Kassi one of the best restaurants in the destination famous for its chic architecture and organic ingredients that are grown on site. The destination sees a lot of tourists all year round due to its savory and scintillating food pallet. The restaurant serves Mediterranean delicacies that come highly recommended by travellers and locals alike. So visit the destination and indulge in the great food scene that the place has to offer and you would be happily surprised. Take a tram or bus from Amsterdam, Hogeweg. How popular is Restaurant De Kas? People normally club together Hortus Botanicus and Hostelle while planning their visit to Restaurant De Kas. 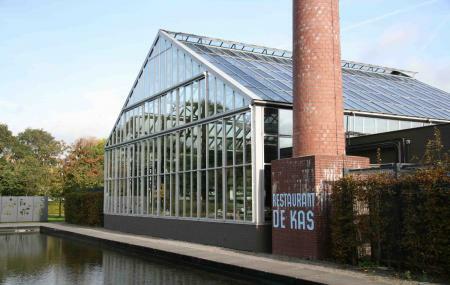 People also prefer to end their day with Restaurant De Kas. Amazing service, state of the art food that actually tastes fantastic. Superior service from the staff. Compliments to the chef (forgot his name but something Bear!?) and his kitchen staff. The overall concept, location, design, atmosphere, music deserved a perfect score. Well done! One of the dishes we were served was duck and I don’t like or eat duck so i didn’t eat it, no fault of the restaurant, it’s just my preference but when the waiter came he insisted the chef makes me a special dish in place of the duck. I’m glad he did because it was AMAZING! They didn’t have to do that yet they did. What a great place! We will be back next time we are in Amsterdam!!! Location is unique. We went for lunch on a perfect sunny spring day and could not be more happy with the experience. We drank a fresh and crisp Provence rose to enjoy the perfectly cooked and tasty three dishes menu that used vegetables from the restaurant owned produce. We will come back and recommend to anyone as the perfect afternoon in the middle of a nice park and garden that we strolled after lunch. Very nice decor and general ambiance. The service was good, staff are friendly. I had the 5 courses menu (vegetarian). The food was good in general, a lot of fresh vegetables. The dessert was delicious. However the only problem was the dressing for three courses out of 5 which included a lot of vinegar which kind of spoiled the taste of the other ingredients. Too bad! I have an extensive list of allergies and they were able to accommodate me perfectly. (Dairy, nuts, wheat, seafood, seeds, etc) Amazing food and service. Would definitely recommend to anyone with any dietary restrictions, they are able to make you something that will blow the little minds in your tastebuds.